Emanuele Magini is an Italian designer was born in Arezzo in 1977. He is most know of his 2003 participation to the 11th Biennale of Mediterranean Artists, with the project “Middle ground, a forum for peace in Jerusalem”. Emanuele has graduated from Milan Politecnico (2004) with a final dissertation on the semiotic of holidays. After graduation he worked in several different design and architecture studios, in the field of scenography and set design cinematic productions. Emanuele Magini has won several international design awards, and his products and projects has been published in national and international magazines. He opened his own studio in 2010. 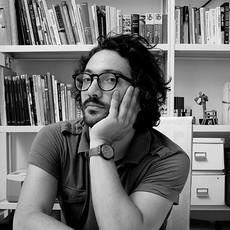 He has opened his own Studio and he is working for several brands including Heineken, Campeggi, Seletti and Verona Fairs.